System Recordings News: Defunct! feat. 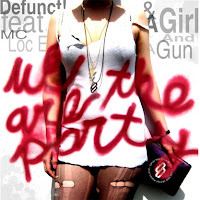 Mc Loc E & Girl And A Gun 'We Are The Party' - Available Now! Defunct! feat. Mc Loc E & Girl And A Gun 'We Are The Party' - Available Now! July 7, 2011 - 5,4,3,2,1…DEFUNCT! presents the anthemic electro smasher "WE ARE THE PARTY" featuring MC LOC E & GIRL AND A GUN. Includes remixes from FIGURE, HOAXX, DSKOTEK, and STEREOYOUTH.